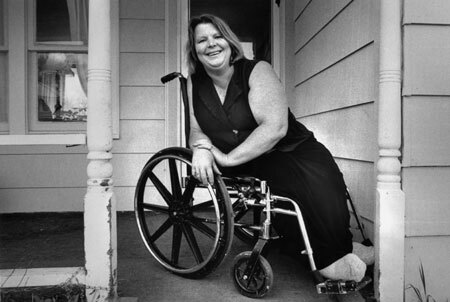 Suzy McGlasson hasn't always ridden in a wheel chair. In fact, it wasn't until she was 25 years old and had fallen 50 feet while attempting to save a trapped baby mountain goat that she lost her unassisted mobility. Suzy waxes philosophical about her fate and simply states that, "we all walk different paths and each of us has our own lessons to learn." Now, 44 years old, our Community Theater director remembers growing up greatly influenced by her mom, a television producer for the FOX series Jump Street starring Johnny Depp. Suzy credits studies of many spiritual beliefs for her self confidence and determination to complete her masters program in theater at WWU. To overcome debilitating bouts of depression, she has raised sheep, ducks, geese, chickens, horses, dogs and cats at different times. Suzy claims her Irish, Scottish, Norwegian, French, German and English heritages have given her insights to many common threads woven into the tapestry of human relations. This week we can observe her professional persistence in action, as she directs the stage production of Cat On A Hot Tin Roof.